Aaron Rodgers is the consensus best football player in the world. If ever there was a game to serve as a test case for the theory that Aaron Rodgers can have success on any team, against any team this may have been it. The Packers offense is depleted by injuries and the Broncos have the NFL’s best defense. Denver’s defense made Rodgers look worse than ordinary, holding him to just 77 yards on 22 attempts for a ghastly 3.33 yards/attempt. Peyton Manning looked like the Peyton Manning of old for one night at least, passing for 340 yards on 29 attempts (11.72 yards/attempt). Denver’s running game also got going for the first time. 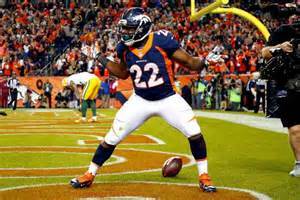 CJ Anderson and Ronnie Hillman combined to give the Broncos 161 yards and three touchdowns. Close wins against unimpressive opponents had been the story of Denver’s 6-0 start. Peyton Manning had struggled all season as his defense did its best to cover up his mistakes. The Broncos that showed up this week may have provided the single best performance of any team this season. If Peyton Manning can play somewhere in the orbit of his performance this week going forward, the Broncos are your new Super Bowl favorites. The Steelers needed a win in this game to make the AFC North a contest, but the Cincinnati defense proved too much in the end. Quarterback Ben Roethlisberger struggled in his return from injury, throwing three Interceptions and averaging just 5.82 yards/attempt. 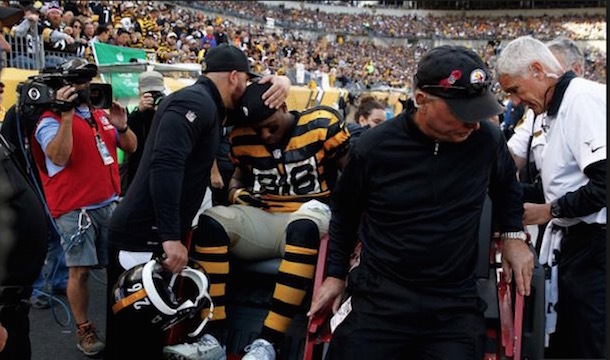 The injury bug bit the Steelers’ offense again with Le’Veon Bell out for the season after tearing his ACL in the second quarter. The Bengals have stormed out of the gate this season thanks in large part to very good quarterback play from Andy Dalton. Dalton has had a difficult time shaking the reputation that he doesn’t perform well in important games against good opponents, and he did little to shake that reputation on Sunday. His QBR of 27.9 out of a possible 100 was his lowest of the season by no less than 40 points. This was an impressive team effort from Cincinnati to stop an elite offense and win an important divisional matchup even without a good performance from their QB. The Jets’ defense entered this game ranked second in the NFL in defensive DVOA, and the Oakland Raiders absolutely waxed them. Derek Carr had another huge game, passing for more than 300 yards and four touchdowns, but the Oakland offensive linemen were the unsung heroes of this game. Faced with one of the best front 7s in the league, Derek Carr was not sacked once and running back Latavius Murray ran into open space for 113 yards on just 20 carries. Oakland has firmly put itself in the playoff picture. As good as the Jets are at stopping the run, this isn’t the first time we’ve seen them struggle getting pressure on the QB. They must be able to generate a pass rush going forward for the rare occasions when their secondary will err. It’s hard to see this game as anything but a missed opportunity for New York. With a win against a surprising but beatable opponent, they would have improved to 5-2 and opened up a strong early lead in the AFC wild card. They are now 4-3, tied with Oakland, and just one game ahead of division rivals Buffalo and Miami. New York and New Orleans made the bold decision to abandon the concept of defense entirely and the resulting outcome was maybe the most entertaining game of the year. Drew Brees tied the NFL record for most passing Touchdowns in a game by an individual (7) and he and Eli Manning combined to break the NFL record for most passing touchdowns in one game (13). A Kai Forbath field goal in overtime brought both teams to 4-4 as the Giants once again find new and interesting ways to blow games late. But dont worry… they are still first place in the NFC Least. Apart from being a gross game that wasn’t fun to watch, Ricardo Lockette’s horrifying neck injury was one of the worst things I have seen on a football field in a long time – case in point why football almost definitely won’t be around in 50 years. Lions 10 – Chiefs 45: The Chiefs were able to get their running game going, with backup Charcandrick West gashing the Lions for 97 yards on 20 carries. Alex Smith managed the game well, completing a high percentage of his passes and breaking off one huge run. The Chiefs are eliminated from playoff contention in every sense but the mathematical one, but it’s good to see some life from one of the NFL’s more disappointing teams. Buccaneers 23 – Falcons 20: We need to talk about the Falcons. They’ve had one of the easiest schedules in the NFL to this point, and that hasn’t changed in the last three weeks when they’ve dropped games they should have won against the Saints and Buccaneers and struggled mightily to beat the Titans, who just fired their Head Coach. Atlanta posted impressive offensive totals for the first time in weeks, but they were undone by four turnovers. The Buccaneers almost blew another colossal lead, but they held on by their fingernails and got an overtime win on a Connor Barth field goal. If the Falcons want to make the playoffs, these are the sorts of games they need to win to have a chance of catching Carolina or fending off Seattle. Cardinals 34 – Browns 20: An entirely expected, uninteresting blowout that featured a big offensive performance from Cardinals QB Carson Palmer. As fond as Bruce Arians is of chucking the ball all over the field, he decided to give veteran running back Chris Johnson a huge 30-carry workload. It will be interesting moving forward to see if the Cardinals continue to seek more of a balanced offensive attack. 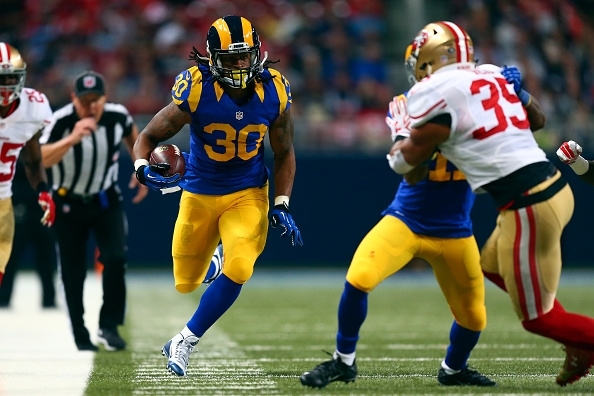 49ers 6 – Rams 27: Todd Gurley is just unfair. He’s already one of the best running backs in the League, and he is the entire St. Louis offense (30th in pass offense DVOA, 18th in rush offense DVOA). The Kaepernick era may be over in San Francisco with today’s announcement that Jim Tomsula will start Blaine Gabbert at QB for San Francisco next week. Kaepernick’s play this season has been undeniably poor, but Blaine Gabbert is clearly not the answer. This reeks of a season that’s going down the tubes. Vikings 23 – Bears 20: Minnesota just keeps scratching out wins in these nail-biters against bad teams. Somehow, they are 5-2 and rank 28th out of 32 teams in the NFL in overall team efficiency, per footballoutsiders.com. You can feel the late-season collapse coming already. Chargers 26 – Ravens 29: The Ravens came out on top of this game between two teams which have had miserable luck in close games this season. Neither of these teams are going to be making a run, so this space will be devoted mourning the loss of blood and guts being everywhere and f—boy Defensive Backs. RIP Steve Smith’s career. You’ve been great … and hilarious. Colts 26 – Panthers 29: The Panthers improved to 7-0 behind a strong performance from their defense, who intercepted Indianapolis Quarterback Andrew Luck three times. Andrew Luck has to be hurt. He just has to be. For all of the Colts’ deficiencies and inadequacies, a decent Quarterback (notice use of the word “decent”) would be enough on its own to cruise to a playoff berth in the AFC South. The fact that Luck must improve if Indianapolis wants to hold off the Texans speaks volumes on how poor he’s been this year. « Previous Article The Last Gunslinger: Is Dan Henderson MMA’s Pound for Pound G.O.A.T ?